Two kids' favourites, coloured sparkles and chocolate chips, add flavour and crunch to these tasty peanut butter treats. Serve as a snack anytime of day. Or, surprise your kids and pack a serving of these Peanut Butter Snack Bites with Sparkles in their lunch bags. 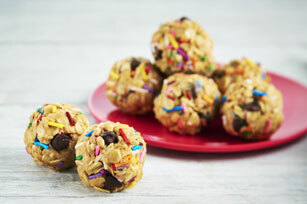 These easy-to-make Peanut Butter Snack Bites with Sprinkles can be refrigerated up to 1 week before serving.